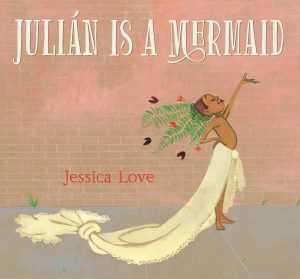 In Jessica Love’s Julián Is a Mermaid, Julián is a young boy with big dreams. When he spies three women dressed as mermaids on the subway, he knows deep down that he, too, is meant to be a mermaid. While his Abuela takes as shower, Julián seizes his chance: a potted fern and a vase of flowers become a stunning headdress, a flowing curtain transforms into a billowing tail, and Julián brings his inner mermaid to life. But becoming a mermaid is a messy process. What if Abuela is mad? What if she doesn’t think Julián shouldn’t be a mermaid? As Julián learns, though, Abuela might understand her mermaid boy better than he thinks. This is a heartwarming story about acceptance and being who you are. Love’s colorful and imaginative drawings help the reader see the world as Julián does, and the simple text flows well with the illustrations, which are the driving force of the story. Young readers can enjoy developing their narrative skills as they follow Julián’s wordless transformation into a mermaid, while older readers will have fun picking out repeated design elements - the pattern of a sea creature appearing again as Abuela’s dress, for instance - and watching Julián’s world transform. Even adults will be captured by Julián’s spirit and ingenuity, as well as the detail and creativity Love puts into her drawings. Readers looking for similar books about self-expression and embracing differences should check out Quackers, by Liz Wong, and The Day You Begin, by Jacqueline Woodson. For those who love Julián’s creative costuming, try Harriet Gets Carried Away, by Jessie Sima. And, for mermaid fans like Julián, Jan Brett’s beautiful reimagining of the three bears, The Mermaid, is sure to please.